The National Union of Students is a Union of students, by students, and for students. At the core of NUS as an organisation is the belief that collective action is the best way to achieve the solid and tangible outcomes for ordinary students. The National Union of Students was formed in 1987 after students saw the benefit of forming one over arching peak representative body for students that would be strong an effective in being the voice for students. Over the years we have worked for students to create a better tertiary system. NUS directs the development of national regulations to deal with faculty ancillary/course material fees and the prohibition of student fees that did not comply. Students on income support at the time were not eligible for rent assistance. NUS lobbying led to the first category of students (homeless students) winning rent assistance eligibility. Extension of rent assistance eligibility generally to Youth Allowance and ABSTUDY students through NUS lobbying. NUS employs WA-based Project Officer to work solely on the repeal of state based VSU legislation. The WA Government agrees to a compromise model (50% minimum funding guarantee for the Guilds) that is still in place today. Along with James Cook University NUS jointly won the legal appeal battle in Australian Competition and Consumer Commission to overturn a provisional ACCC ruling that universal student contributions to campus student amenities constituted a breach of the Trade Practices Act. Full time commonwealth scholarships exempted from being treated as taxable income A ballpark estimate of the cost of the concessions flowing to students and graduates is around $2 billion. Abolition of the highly regressive Student Finance Supplement loan scheme (operating since 1992) where students traded in up to half of their YA/AUSUDY/Abstudy grant in order to receive a larger amount in the form of a loan repayable on top of HECS repayments. The loan was a debt trap with an effective 16% interest rate with graduates repaying up to 12% of their gross income. Since 1998 mature age students on AUSTUDY were not eligible for rent assistance. Removing this anomaly had been a long standing part of NUS’s core welfare reform demands and was often raised by NUS on parliamentary committees. The extension of rent assistance to AUSTUDY recipients was passed with bipartisan support in the final Howard Government budget. (budget papers put the cost at $87 million over the four year forecast). Success at getting campuses that were breaching the Commonwealth Ancillary Fees Guidelines to repay the fees to students (following an NUS student-led survey of 5 campuses). Commonwealth Start Up Scholarship Scheme grants of $2254 a year for all 130,000 domestic students on Centrelink benefits to cover up front costs like textbooks, internet, computers, course material fees ($1.3 billion over the 4 year forecast period) Later budget cuts by the Gillard and Abbot Governments led to the Start Up Scholarships being converted into loans in 2015, and extension of student income support generally to masters by coursework students was delayed and then scrapped in late 2014. Nevertheless the overall benefits that were implemented were much better targeted at disadvantaged students than the previous arrangements and have been central to the lifting low SES participation rates across the sector. NUS appointed to Australian Universities Quality Agency Joint Steering Group. In 2010 NUS runs first large scale student-run national Quality Survey. After 2006 NUS kept the issue of VSU alive in the parliamentary sphere with our national reports, rankings and lobbying which led to a parliamentary inquiry into the impact of VSU and the government decision to change the legislation. In 2010 the Gillard Government managed to get a partial repeal of VSU (the Student Services and Amenities Fee) past the Senate. It was not NUS’s preferred model but the legislation was amended on NUS advice to include student advocacy services on the list of allowable SSAF-funded services. NUS President appointed by Education Minister to the Rural Tertiary Hardship Taskforce to develop the guidelines for the distribution of $20 million of emergency grants to the most disadvantaged young regional and rural students. Successful joint lobbying with Universities Australia to get the government to extend the National Rental Affordability Scheme to university students (subsidised rentals, building new student accommodation). NUS President appointed by the Education Minister to the three member SSAF Student Services, Amenities, Representation and Advocacy Guidelines Review Panel. Several significant changes were made to clarify the guidelines and strengthen reporting requirements to the student body on the university’s use of SSAF revenue, including the requirement of student consultation in SSAF distribution at a minimum. Most of the primary research for the review panel was derived from the NUS SSAF Surveys. 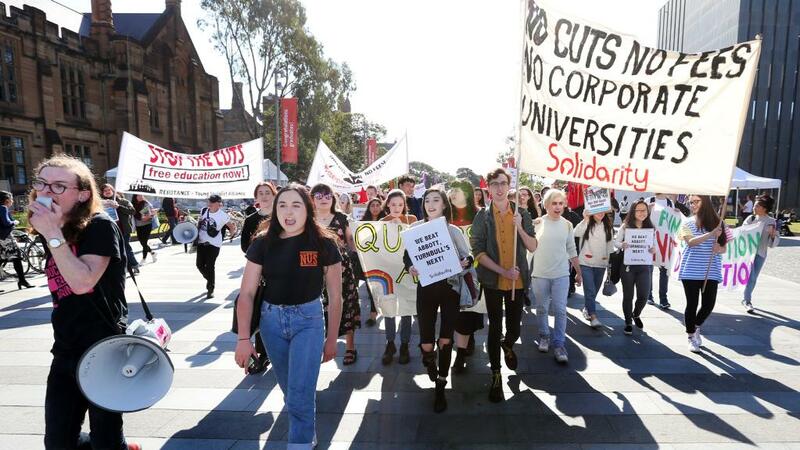 NUS, CAPA and the NTEU were the only significant peak higher education sector bodies to call for the defeat of Chris Pyne’s radical undergraduate tuition fee deregulation legislation. The legislation was defeated through work on submissions, research, presentations at hearings into the bills and most publicly, several NUS lead National Days of Action which saw thousands of students at each demonstration. So far the legislation has been voted down by the Senate twice on the 2nd of December 2014 and again on the 17th of March 2015. The National Tertiary Education Union research shows that 80% of Australians are opposed to university fee deregulation. The most substantial amendment was dropping the market rate of interest on HELP debts. A guarantee that domestic student fees are lower than international student fees for the same course. NUS believes that tertiary education in Australia should be free for all. Access to a quality education, irrespective of social status, ethnic or cultural background, gender or location should be fundamental to the the principals of education in Australia. Since 1997 Australia has consistently sat in the cluster of six OECD countries with the most expensive universities. In Australia, New Zealand, United Kingdom, United States and Canada the fees are underpinned with widely available loans schemes. Japan and Korea have mainly private universities with very limited access to mortgage style loans so family wealth (or a commercial sponsor) is the main driver of access. The OECD country with the most expensive fees, Chile is also heavily reliant on private universities and commercial loans. However, in 2013 the new government has committed to introducing free education within six years. NUS believes student money should be in student control, not sent straight to the bank accounts of university administrations. Student services have been eroded in recent years and it is because the money students pay to support these services isn’t being directed to them. The 2013 NUS SSAF Survey has found many universities are appropriating these fees for their own use and the money returned to students varies from university to university. In 2005 the Howard government successfully passed the Higher Education Support Amendment (Abolition of Compulsory Up front Student Union Fees) Bill (also known as Voluntary Student Unionism (VSU).It marked an end to Universal Student Unionism (USU) in Australia and since its introduction, student unions have been chronically underfunded and are often reliant on tied funding from universities. NUS will continue to advocate for a return to Universal Student Unionism so students are able and resourced to advocate for their rights, the living standards, and for a better education.